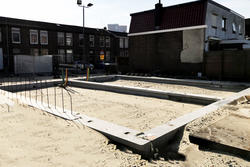 Following the demolition of the old factory buildings and a shipyard on Bleekersstraat, 26 newbuild dwellings are to be built here. 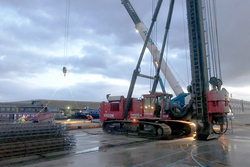 The local situation in Zaandam demands solid foundations for this, in this case the requirement can be met with DPA piles, topped off with pre-fab foundation beams. 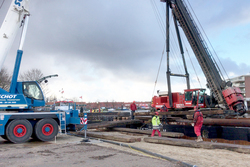 The project is being managed by Royal BAM Group. 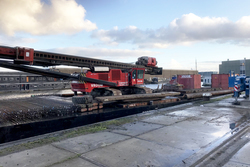 In consultation with residents in Bleekersstraat, it was decided to transport the pile driver across the Zaan to the building site. 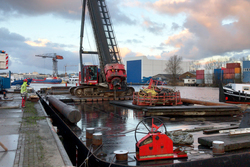 In addition to the pile driver, certain other building materials will be delivered by boat. 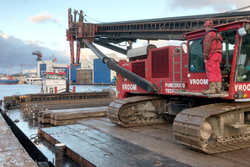 The project site is right on the banks of the Zaan, a stone's throw away from Zaandam town centre. 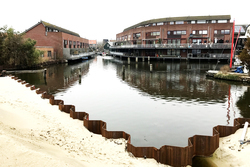 What is special about the 'Thuis aan de Zaan’ project is the three architectural styles that are being used here. 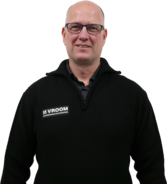 19 detached houses are being built in '1930s-style’ architecture, which matches the existing building in the Vissershop locality, which has recently been completely refurbished. The 3 dwellings on the wharf are sturdy quayside houses that recall this area's industrial past, when warehouses lined the Zaan. A significant detail is that the residents of these 3 dwellings have the option of mooring their boats in their private wharf. The last 4 dwellings on Bleekersstraat are also inspired by the area's history. There used to be a shipyard here, and these dwellings have been designed in keeping with the style of the area.